Can you thread a needle? Then you have what it takes to join our team of Hearts Volunteers! 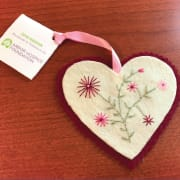 At Arbor Hospice, our Hearts of Remembrance ornaments have become a signature fundraising campaign for the Arbor Hospice Foundation raising more than $65,000 annually in support of patient care, pediatric hospice, grief support, and massage and music therapies. This amazing program was started more than 25 years ago by generous volunteers-many whose loved ones received care from Arbor Hospice. It is a unique way for them to give back to the community and ensure Arbor Hospice patients and families know they are not alone. Each year a new design is created-making these Hearts unique keepsakes, and for many families, collectibles. Hearts come with a ribbon and tag to write a loved one’s name on it-making it easy to hang it on a holiday tree, or from the refrigerator, window, etc. They are available each year for purchase to the public. To continue the program, we are seeking additional volunteers to help create these lovely Hearts. It helps if you have a bit of a crafty side, and are willing to learn to stitch - no experience embroidering necessary! We wouldn’t be able to achieve such success in the Hearts of Remembrance program without the help of our amazing volunteers. We hope you’ll join us to ensure the future success of this wonderful program! If you are interested in helping to create these beautiful keepsakes, please contact Danielle Cook at dcook@hom.org. Thank you!